Years ago I heard about a song writer, possibly Woody Guthrie, famous for “This Land Is Your Land,” who supposedly stood on a street corner handing out copies of his songs to anyone who would take one. He–maybe it wasn’t Woody–said that when somebody actually stole one of his songs, claiming it as his own and having success with it, he’d know that he himself had arrived as a song writer. 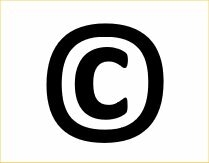 I don’t put a copyright symbol on any of those, and I feel certain some people probably look at them and wonder why. Let’s back up forty years or so to the time when I wrote several musical dramas and a number of more songs yearly than I do now. I had high hopes that my music would go somewhere, and I went through the copyright process for some of them. Nobody ever wanted to publish or record any of my music, though, and–to the best of my knowledge–no one ever stole any of it, either. You might say I got tired of standing on the street corner, figuratively speaking. So why bother to copyright? Creative works are automatically protected without doing anything official, but proving the ownership of a work might become an issue that only the proof of creation date could establish. One very special factor affected my decision not to worry about officially copyrighting any of my works. Because all of my songs and novels have Christian themes and because I want them to have an opportunity to influence other people, particularly non-believers, in a positive way, I consciously decided not to copyright anything not published by a traditional publisher. Authors wanting to quote Christian lyrics in their writing are apt to have a tough time of it. It’s basically illegal to quote any of a song’s lyrics without the author’s or publisher’s express permission. That can be a time-consuming and expensive process. Even though my songs aren’t familiar ones an author would be apt to have ever heard of, I created my other blog, As I Come Singing, specifically to give authors a free source of potential lyrics. I’d like to hope some Christian musicians–maybe just kids learning to play guitar or Christians in another country or even Christians in a highly restricted country, where being a Christian is more dangerous than most of us can imagine–will find the songs on my website and perhaps use them or at least draw inspiration from them. I suppose my attitude wouldn’t make much sense from a business perspective, but I’m not in business. Not to make money, anyhow. But sharing my faith through the creativity God has blessed me with is infinitely more important than any amount of money my uncopyrighted works could ever earn. What about you? Would you be willing to give away the products of your creativity if you thought they might help someone? How about leaving a comment. This entry was posted in Copyright, Creativity, Lead Sheets, Outreach, Woody Guthrie and tagged As I Come Singing, Copyright, Creatitivity, Free Christian Lead Sheets, Free Christian Lyrics, Sharing Free Materials, Woody Guthrie. Bookmark the permalink. I think this entry is about giving. Sharing. Bing openhanded with people. Giving all depends on the kind of person you are. If you love people, humanity, you will share with anyone in need whatever it is you have available, not just something like a poem. If you are always sizing up the back pocket of people you meet you won’t share a wink. i’m pretty good at judging people and it seems to me the more you have the less you share. Rich people have more locks on their doors, more safes to hide their things. I like folks who are easy to speak with, fun, intelligent, spontaneous, curious folk who know about the world, are interested in life and the complexities of the world. They are rarely folks with money. I have a theory as to why that is so. It’s because rich people think everyone is trying to take something form them. SO they miss out. They lose the joy of giving. It becomes a way of life to squirrel away in their little castle. Sharing is such an important facet of being a good person that I think you cannot be considered a nice person if you are miserly, a skinflint, cheap. It’s an essencial aspect of Christianity. Sharing your thoughts in this blog indicates you are not preoccupied with money. Otherwise everything you write would go directly to a publisher. You are all right by me, Sir. Tom, great thoughts, as always. No, I’m definitely not preoccupied with money. We have enough to live on and do a few things we want to do and buy a few things we’d like to have (other than simply having to replace the things that have worn out). And we tithe our income, something we consider the most important use of our money–and what comes out of our checks first. God doesn’t need our money, but we know He can use it more wisely than we can. Tom, I really like the way you worded your reply. Rich people think that they’ll lose out if they give something away. But in reality, Roger is richer for having shared his gifts with the world. Agreed Joel. That was the spirit of my reply. It’s nice to see there are real people doing lovely things in this world.